SEPTEMBER 2007 -- The summer is drawing to a close and many of us are returning from our vacations. As we return to work we must also think of our Grange work. Our Annual State Session is approaching and to make it a successful one we must plan and do some work now. The policies that our Order will develop for the coming year start in the Community Granges. These are the resolutions that each Grange has written. The problems in your communities that need to be addressed, changes in our Grange Law that will help all our members. These are the resolutions that will be acted upon at our Annual State session and if approved there will be sent to the Annual National Session in November. Several resolutions have already come into the State Office. There is still time for your Grange to include yours. Our Order works from the ground up and this is your way to make your influence known. As the new Grange year begins many Community Granges will be installing new officers and many will be installing the same ones. Whichever the case may be it is important that we all work with each other for the benefit of our Order. I know we all have differences of opinion but once a decision is made as to who is in charge or how something will be done, all we should be thinking about is how can I help to bring this about. This is also fair time. 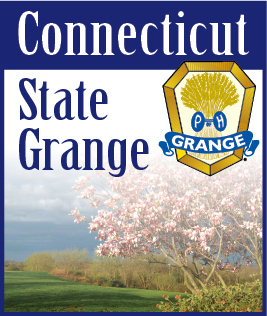 I know the disappointment that the State Grange did not have a fair this year but there will be many local Grange fairs. Most of them have interesting exhibits and attractions and good food. Attend one of these fairs and support other Granges. If possible help out at some of these fairs. Everything you do to aid another Grange makes our Order stronger. Speaking of fairs The Eastern States Exposition, The Big E, is running September 14 to 30, 2007. The New England Grange Building will be open all these days and the Connecticut Room in the building will be open and manned the entire time. Thanks to Doris Shaw, who has been doing this for more years than I can remember, volunteers are being collected to man this room. Anyone interested in helping out or working in the Grange store or just being an ambassador and meeting with the public please contact Doris Shaw or Betty Jane Gardiner or me. We would be delighted to have you and you will have some free time to enjoy the fair. This building is the Grange’s connection to the public. For all who are asking, information on the 123rd Annual State Session is included in this issue and more detail will be provided in the October issue.